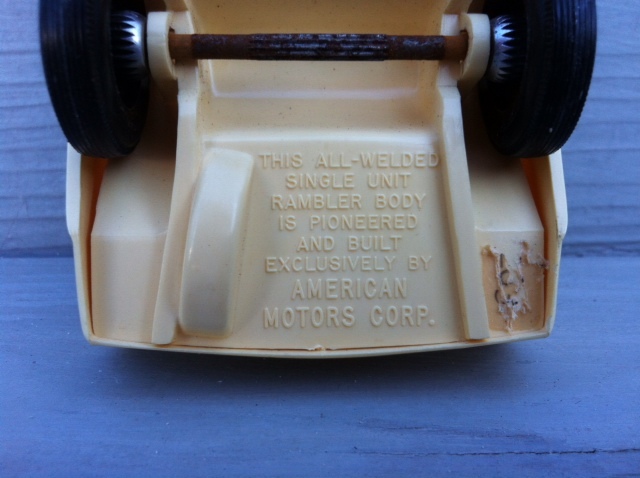 Sometimes when I mention my affection for American Motors and Ramblers I get a chuckles. “That’s the company that made the Pacer and the Gremlin, right?” they say. Well…..yes but those were just a few of the innovations AMC had in it’s history. Actually AMC had a massive impact on the auto industry in general. 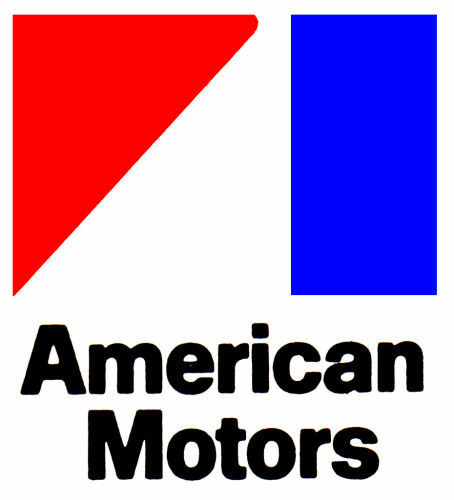 Facing GM, Ford, and Chrysler though out their 33 year history, AMC had to continually innovate to survive. One of their biggest innovations was using outside suppliers for components for its cars while the Big Three completely build their cars in-house. Another was their invention and first use of unibody construction. Nash Motors released their 600 in 1941 using unibody construction as opposed to body on frame. 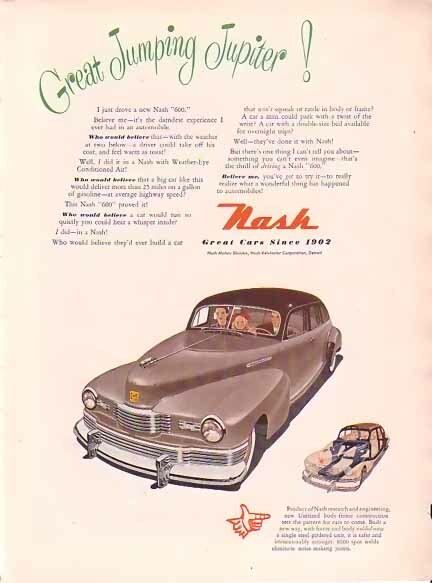 Because the body was constructed as a single unit, Nash produced a vehicle that was not only stronger, but about 500 pounds lighter than a traditional body-on-frame automobile. 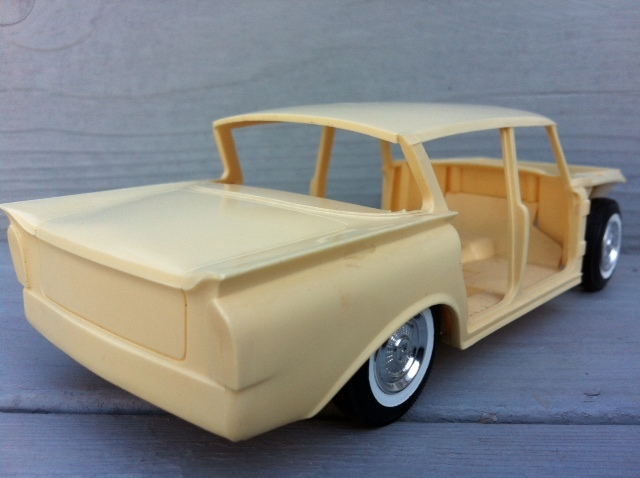 Ramblers were the first cars to use Unibody construction throughout their model lineup. The primary advantage of this technology is a stronger structure without the need for a separate chassis. 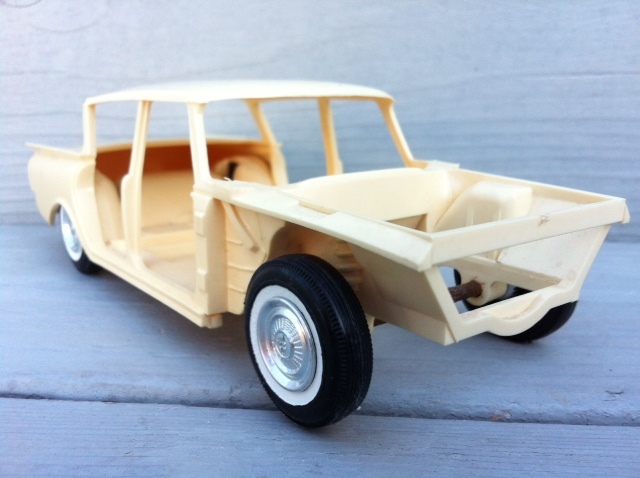 With less squeaks and rattles, the overwhelming majority of contemporary automobiles, with the exception of trucks and some SUV’s, owe their design to some form of this 1960s cars’ original unitized body construction innovation. Here’s where my promo model comes in. So one day I was at a local hobby shop and saw this car sitting up on a shelf. I asked the shop owner how much….wait for it, wait for it…15 bucks so I snapped it up. This essentially a 1960 Rambler showing nothing but the unibody. It’s really kind of cool seeing the car this way before final assembly. AMC was really proud of it, as they should have been, and touted it on the bottom of the model. 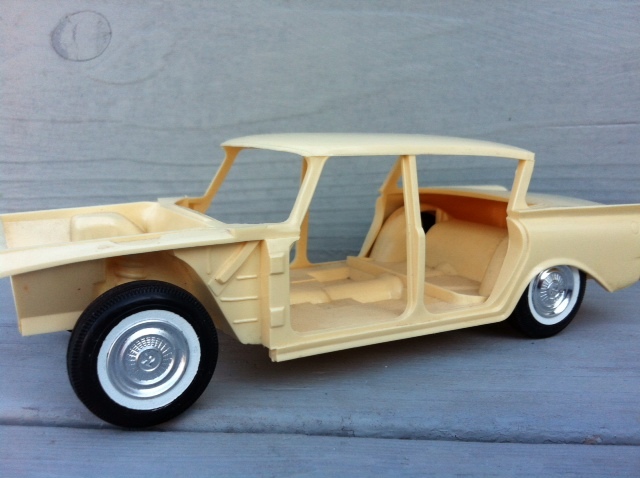 This one of the original issued models by JoHan. Later one they re-issued it and even those are difficult to find. Except for a bit of rust on the axles this one is cherry. How much are they worth? About $150 with out the box and close to $200 with the box. I need to start looking for the box.